How to find us, how to contact us, how to tell us what you think! 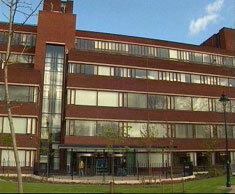 All Saints Library is situated on Oxford Road approximately 15 minutes walk from Manchester City Centre. All Saints Library supports the Faculties of Arts and Humanities, Business and Law, Education, Health, Psychology and Social Care and Science and Engineering. It also houses Book Design and Special Collections. Please note: All Saints Library is called Sir Kenneth Green Library on the campus maps.